Expand each region below to read more about the area. Read more about these destinations below, then decide on the areas you wish to visit. Check our Tour Recommendations. To download a large more detailed map, click here. This map is in PDF format, which you can print. 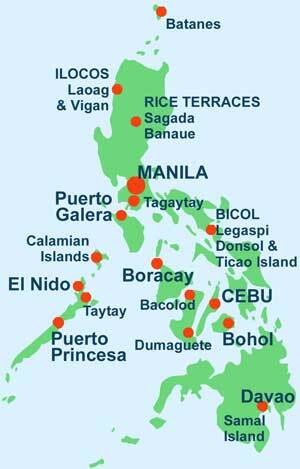 The most popular regions of the Philippines are listed below. Expand each region heading to discover more about the principal destinations that that area has to offer. Manila - Most holidays start and end in Manila. Many destinations are connected via Manila too - it's like the hub of a wheel. On a city tour, explore old Intramuros and Fort Santiago. From Manila, you can take day trips to Tagaytay, Taal Volcano, & Taal Town, Corregidor Island Fortress, or Villa Escudero, or maybe enjoy a sunset dinner cruise in Manila Bay. The Rice Terraces - Known as "the eighth wonder of the world", the Banaue Rice Terraces stand as an awe-inspiring man-made landscape in the Cordillera mountains. Nearby Sagada is renowned for its hanging coffins, caves, picturesque scenery and cultural delights. In the south west of the Cordillera Mountains can be found Baguio, "City of Pines". Travelling by air, you'll fly into Laoag, the capital of Ilocos Norte. Explore Laoag's heritage sites featuring Spanish colonial buildings, and Philippine-baroque churches. The UNESCO Church at Paoay is a particularly impressive structure. The beauty of nearby Pagudpud's white sand beaches, especially Saud Beach, is another attraction for visitors to this region. Vigan - a UNESCO Heritage Site, is one of the Philippines most attractive cities, featuring numerous colonial style historic buildings. A tour of the city, and its surrounds, is well worth enjoying. Bicol - Legaspi and Donsol - The perfectly formed Mt Mayon Volcano is the impressive backdrop for Legaspi (sometimes spelt Legazpi). A Tour of Albay Province lets you see how the volcano has affected the lives of the local population down the ages. Trek Mt Mayon, or the National Park that includes Mt Bulusan Volcano. At Donsol, between November and May, you have a chance to swim with whale sharks! Ticao Island is a peaceful spot to get away from it all, and is a base for those who wish to dive with Manta Rays. Camarines Sur (CamSur) is a fast growing tourist area. Visit the city of Naga, explore the sandy beaches and islands of Caramoan. Puerto Galera - On the island of Mindoro lies Puerto Galera - situated on one of the world's most beautiful bays! Puerto Galera is especially popular due to its close proximity to Manila. Here you can enjoy Diving, Snorkelling, Golf, Whitewater Kayaking, Trekking, and even Learn to Sail! In 2017, for the second year in a row, and the third time since 2013, Palawan, (the Philippines "Last Frontier"), was voted the “World’s Best Island” by readers of Travel + Leisure magazine. Start to explore Palawan starting in Puerto Princesa. Take a City Tour, or a boat trip around the islands of Honda Bay. Visit the wide open spaces that are the beaches of Sabang. Take a boat trip through the amazing St Paul's Underground River. Let local experienced guides show you the features of ancient mangroves. Unwind with a peaceful relaxing break at Sabang's luxury Sheridan Resort & Spa. Escape from it all at Port Barton, or other "away-from-it-all resorts" such as QI Resort, or Flower Island. Boracay - The lively island of Boracay, is famous for its White Beach, and is considered the No.1 beach in Asia. There are two airports in the north of neighbouring Panay Island that serve Boracay - Caticlan Airport, and the larger Kalibo International Airport. Visitors to Boracay can enjoy a wide variety of activities, including water sports, diving, island-hopping trips, including a visit to the fascinating Motag Living Museum on neighbouring Panay, (by request). A popular part of the Philippines, the historic city of Cebu, is situated on an island of the same name. Cebu is the 2nd City of the Philippines, and provides an alternative point of entry, with its international airport. Bohol, with its distinctive Chocolate Hills, is an attractive island, and a Countryside Tour is well worth undertaking. Most resorts and hotels are situated on Panglao Island, which is connected to Bohol by a short road bridge. On the island of Negros, Dumaguete is the "Town of Gentle Folk", and is popular for Diving, especially around Apo island. Dumaguete also offers Countryside Tours. In the north of Negros is Bacolod. This is an area known for its Sugar Plantations, and those who wish to see historic ancestral houses and haciendas will enjoy a tour of the region around Bacolod, including Silay, and Talisay. Bacolod is just a short ferry journey away from Iloilo, Panay, and the two destinations combine well for those interested in touring the two areas to see the historic houses and churches that each region contains. For many visitors, Panay is an arrival point for travelling to Boracay Island, which is served by two airports - a small airport at Caticlan, close to the ferry port, and the larger Kalibo International Airport. Kalibo hosts the famous Ati-Atihan festival every January. To the very south of Panay can be found the attractive city of Iloilo. This city lies on the beautiful Iloilo River, with its attractive esplanade, featuring retaurants and coffee shops. Near to Iloilo is Miagao Church, a UNESCO Heritage Site, which features a highly decorative, attractive facade. Calamian Islands - Busuanga and Coron are the highlights of the Calamian Islands, an unspoilt part of north Palawan. Popular with divers, due to its large number of World War II shipwrecks. Here you'll find beautiful scenery, wildlife, trekking and climbing, as well as watersport activities. Calauit Island is a game preserve and wildlife sanctuary featuring endangered African animals. Luxury Resort Packages include Two Seasons Resort and Spa, and Huma Island Resort. There are also quiet retreats that are totally "away from it all" such as Cashew Grove, and Sangat Island Dive Resort. Aurora is situated on the east coast of Luzon, to the north-east of Manila. It is known as the coconut capital of the Philippines, and is the perfect place to enjoy fresh buko juice. Aurora is a fast emerging tourist destination which has Baler as its capital. Baler is where Philippines Surfing was born! Although the best waves occur between October and March, it's usually good for surfing all year round. Baler is reached by travelling through the Sierra Madre mountain pass - a picturesque journey of around 5 to 6 hours, or by a 30 minute flight, when available. Between the Cordillera and Sierra Madre mountain ranges, to the very north east of Luzon, is Cagayan Valley. Its Northern Sierra Madre Natural Park is the largest protected area in the country. The Cagayan River runs through the valley and is the Philippines' longest river. Callao Cave is a top tourist attraction, being a cave with seven chambers. One of the chambers has been made into a chapel, and has an opening through which sunlight enters, creating a spectacular sight. Visitors to Cagayan Valley normally arrive by flying into Tuguerao, the region's capital. Davao & Samal Island - Davao is the capital of Mindanao, and is where ferries depart for Samal Island. Siargao is an island popular with Surfers and for Game Fishing. Batanes Islands. The most northerly part of the country, and away from it all, Batanes is an unspoilt and remote group of islands. There are daily flights from Manila. Philippine Trails Ltd is a registered member of the Travel Trust Association. This means that you can book your holiday secure in the knowledge that Travel Trust Association will protect you in the unlikely event of a member becoming insolvent. You can also book Travel Insurance online via World Nomads.